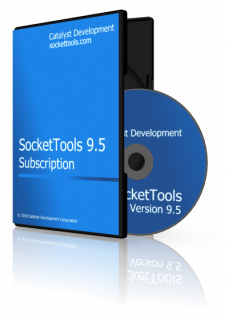 The SocketTools Subscription is a suite of Internet components and libraries for Windows software development. The SocketTools Subscription provides you with every .NET class, ActiveX control and library in all three SocketTools editions. It also includes unlimited, priority technical support along with free upgrades to new versions when they’re released. The SocketTools Subscription is a comprehensive suite of managed code .NET classes, ATL-based ActiveX controls (OCXs) and dynamic link libraries (DLLs) which can be used in a wide variety of programming languages. It provides everything that you need for any type of project, and offers real value for professional developers who use a variety of software development tools and programming languages. The subscription includes more than 80 components and libraries which can be used to develop applications that meet a wide range of needs, using virtually any development environment and programming language. It’s a great value for developers who need to work with multiple programming languages and target different platforms. Unlimited priority technical support is included with each SocketTools Subscription, ensuring that you can get the critical help you need when building and testing your products. Response times for support questions are guaranteed to be on the same business day, and on-demand hotfixes are available when required. Your annual subscription entitles you to free updates and upgrades to new versions of SocketTools as soon as they’re released. You will always have the latest version available to you, whenever you need it. When your subscription ends, you can renew at a substantial discount and continue to receive new releases and technical support. A SocketTools subscription includes free priority support by e-mail, and access to support resources such as our knowledge base and online help. Technical reference documentation and example programs are included for each of the SocketTools editions. To evaluate SocketTools, download one or more of the individual editions that you would like to work with. You can download multiple editions if you wish, and each edition includes a free thirty (30) day evaluation license. After you’ve purchased the subscription, you can use any of the SocketTools .NET classes, ActiveX controls and libraries in your projects and redistribute them to an unlimited number of end-users without any additional runtime licensing fees.